All our products, except for punch pins and blades, are guaranteed for one year from the date of invoice (dispatch date). In the unlikely event of a fault occurring in fair and normal use (as per the relevant published specifications), we will repair the item concerned. If we are unable to repair it we will replace it or failing that, refund the money paid for it in full. In addition, where unwanted goods* are returned within 21 days of delivery, a full refund will be made as soon as all goods are received by us in an unused and satisfactory condition. The company reserves the right to deduct charges from the refund for any goods that are returned in a damaged state. Furthermore, J & C R Wood Ltd will not be held liable for the loss of any returned parcels, so we recommend that you obtain proof of posting and take out adequate parcel insurance to cover against consequential loss by the post office or your chosen courier. *The term goods refer to any standard Metalcraft products, except for any tools or parts thereof which have been specially modified to meet a customer’s specific requirements. Due to a policy of constant development, J & C R Wood Ltd reserves the right to alter designs, specifications and prices without prior notice. Delivery within 3 working days- (Delivery to Isle of Wight, Isle of Man, Channel Isles, N.Ireland, Scottish Highlands & Isles may take an extra 1 or 2 days). Next day delivery £12.99 – UK only. It will be delivered the next working day provided the order is received here before 2. 00p.m, your payment is authorised, and the goods are available in stock. (Delivery to Isle of Wight, Isle of Man, Channel Isles, N.Ireland, Scottish Highlands & Isles may take an extra 1 or 2 days). If we are unable to send your order out for next day delivery you will not be charged the premium and we will take every sensible measure to advise you accordingly. Bulgaria, Croatia, Cyprus, Estonia, Finland, Greece and Greek Islands, Hungary, Latvia, Lithuania, Malta, Poland, Portugal including Azores & Madeira, Romania, Sweden, Slovenia. Non-EU: Switzerland, Liechtenstein, Norway, Serbia, Iceland, Canary Islands, Andorra, San Marino, Albania, Bosnia & Herzegovina, Macedonia, Moldova, Montenegro, Turkey, Vatican City. Do I need welding or metalworking skills to be able to use the tools? A. None whatsoever. The metal craft tools are safe and easy to use and they do not require any heat or electrical power. All functions are carried out by hand power and are designed for beginners and professionals alike to work with metal without having to heat it up. To join metalwork together, some of the tools make use of an ingenious riveting system which creates attractive looking traditional joints but avoids the need to be able to weld. However, for those of our customers with the appropriate equipment and skills, welding can be used, to join the metalwork created by Metalcraft tools together. 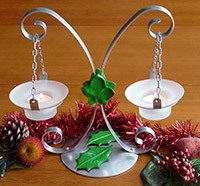 How do I attach candle trays and other accessories to my finished metalwork? A. Where it is physically not possible to rivet, or where a temporary fixing is required, our 3mm nut & bolt fixings can be used with the aid of a screwdriver and one of our special spanners. One other useful tip is that if the longest (12mm) bolt is used on a candle tray with the thread pointing upwards, the thread can act as a useful spike on which to secure the candle. A further tip to make this type of joint permanent, is use a dab of strong adhesive (superglue) in the thread of the nut after it is tightened to stop the nut from working loose. Our range of Easyfix craft accessories have a special mounting tag on the back that allow it to be either riveted in position or where this is not possible a nut and bolt fixing can be used. By contrast our larger range of SelfFix Craft accessories do not have the fixing tag on the back. However, with our new ultra strong J-B Weld Epoxy Steel Resin you can attach your own custom made fixing tags made from a bent and punched section of our 10mm x 1.6mm steel strip. This gives you the ability to fix the tag in the most appropriate position to suit its position on the finished project. To bond the fixing tag effectively make sure the face of the tag that makes contact with the back of the accessory is as long as possible and ideally punched with a few holes to improve the flow of the JB Weld around two surfaces. When the fixing tag has bonded to the back of the accessory, you can then attach it anywhere you want on your Metalcraft project using rivets, nuts & bolts in a similar fashion to the Easyfix accessories or even by careful welding or soldering. Adding this wider range of attractive decorations gives greater scope for individual styling of your projects especially if the accessories are made even more eyecatching when painted in contrasting colours. Some of your designs show candle trays and clocks, where do I buy these from? Click on the Products button on the above navigation bar, you will be taken to our on-line store where you can easily buy all of these items and more! 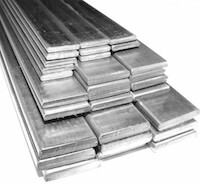 What can I make with Metalcraft? A. The list is endless. 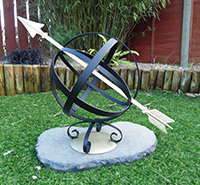 Why not click on the “What You Can Make” to see just a small number of the metal craft ideas that can be made. 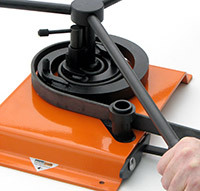 Don’t forget that the tools are also useful for all sorts of domestic and commercial repairs and maintenance. In fact anywhere you need a bit of shaped steel to make a strong and lasting repair, Metalcraft tools are great additions to your tool box. What coating or paint do you use on items made with Metalcraft tools? A. Steel needs a protective coat especially if located outside. For best results, use any generally available primer paint for use on steel. Then paint with a compatible top coat - a wide range of attractive colours, finishes and effects are widely available. You can apply this by brush or aerosol, the latter being more suitable for smaller objects and getting into joints that brushes have difficulty reaching. Brands such as Hammerite and Plastikote are available from all major DIY & Hardware stores as well as specialist paint outlets. If operating on a larger scale or business basis, wet spray painting can be used, or if preferred, dry electrostatic epoxy and polyester powder coatings are available usually through commercial Coaters/Spray painters. Both our Design & Ideas book and our User Guide give more in depth tips and advice on this subject. What Guarantee is provided on the tools? A. All of our metalcraft tools and the components on them are guaranteed for one year from the date of supply. The only exception to this are consumables (punch pins and cutting blades). In the unlikely event of a fault occurring in fair and normal use, we need to know about it as soon as possible. We will then repair the item concerned, replace it or refund your money if you are still not satisfied. What size rivet should I buy for joining metalwork together? First Choose the correct diameter of rivet. Our 3mm rivets are available in four different lengths. 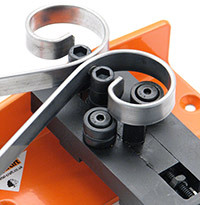 These are suitable for use with 3mm holes punched on the Practical Punch/Shear (or the Master Punch/Shear Fitted with 3mm Punch Block & Pin) or the XL5+ Power Bender (using the 3mm punch block & pin). Our 5mm rivets are supplied in four lengths suitable for use with holes punched on Master Punch/Shear fitted with 5mm Punch Block & Pin or XL5+ Power Bender fitted with the 5mm Punch Block & Pin. Then choose the correct length of rivet. This is dictated by how many strips of metal you are joining together and their total thickness. If working with up to 3mm thick steel bars to be riveted together, the rivet should be approx 2-3mm longer than the combined thickness of the metalwork being riveted. If riveting steel bars thicker than 3mm together the rivet should stand proud by approx 3-5mm longer than the combined thickness of the metalwork being riveted. For this reason, it pays to have a packet of each size of rivet available so that you can rivet a variety of joints. We offer some great deals on bulk supplies of rivets (see our MC1272IWCC by clicking on Products and then Organiser Boxes). What tools are available in the Metalcraft range? A. The range consists of different multi-function tools to scroll, twist, cut, punch, bend, roll, and join metal strips together. They provide you with everything you need to produce professional looking practical or ornamental metalwork in a classic wrought iron style. You can buy individual tools for making specific elements or components, or even buy a complete workshop package of tools containing all the essential elements needed to start a new and exciting DIY/Craft hobby or business venture. They are available in three size ranges starting with the smaller Practical range, the mid size Master range and the hugely impressive XL range. To find out more view METALCRAFT TOOLS. A. All of our tools can be purchased individually if you wish to gradually build up your collection. However, with our special workshop packages we provide a range of kits and deals for people to buy a complete set of tools to get started . These kits offer some good savings over buying the tools individually making them a very attractive proposition for many who are new to Metalcraft. In certain cases, we can put together a tailored package of tools, for those wanting a different set of tools to those in our standard workshop packages. What training and support is provided for beginners? 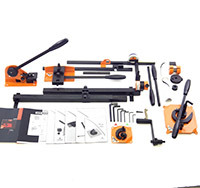 A. Metalcraft is backed by a comprehensive set of useful instructions and aides. Each tool we sell is supplied with a detailed operating instruction booklet showing how to set up and use the tool. We always suggest that it is worth reading through this before you get started. No training is required whatsoever. 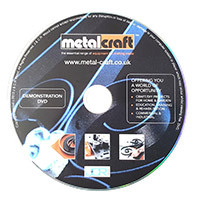 In addition, our brand-new Demonstration DVD provides a demonstration of how to use all the Metalcraft tools and includes a demonstration of how to make a great looking project in a few minutes. Metalcraft offer starter and design packs great for novices, it’s the perfect starting point to successful Metalcrafting. 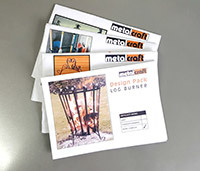 Each pack contains all the necessary materials, fixings and accessories to make three straightforward design projects which have been carefully selected to introduce you to the different tool functions and techniques needed to make things with Metalcraft. Each project has an easy-to-follow instruction sheet that ensures you will achieve great results and shows how you can go on to develop each idea further, thus giving you the confidence to move on to our Design Packs (overleaf) and/or onto designing your own ideas. We also offer variety of free to download design instructions containing a step by step guide of how to make each individual project plus the details of materials needed. These are a great starting point for any new to Metalcraft. Register now to access our Free Stuff section. Our User Guide booklet is a useful resource full of design tips for those wanting to create their own designs. It also has several additional design projects for Practical & Master Tools included in the back. Finally is our Design & Ideas Booklet which contains more projects to make but is also packed with over 100 illustrations of Design ideas to inspire you in creating your own designs. All these books and guides should ensure you get the most from your Metalcraft tools. However, whether you are contemplating buying our tools for the first time or you are regular customer, if you have any queries or technical issues, we are only a call or e-mail away and we will do our utmost to answer your question as fully and as helpfully as we can. Because we have manufactured Metalcraft tools since the 1950's you can be assured that as the designers, patentees and manufacturers of the true Metalcraft tool range, our success and reputation as the world leaders in this type of equipment has been built on experience and after sales service. This sets us apart from the competition and poor-quality imitations that you may encounter. Which range of tools would be best for me? A. Most people who purchase the Practical range do so because they are looking to make smaller scale items. Often these involve small or intricate scrollwork in smaller size steel strips from 10mm x 1.6mm up to 20mm x 3mm. That is not to say that the Practical range cannot be used to make large items such as gates or furniture. However, if the item being made is load bearing or requires a significant degree of strength, it may have to incorporate quite a number of scrolls or jointed metalwork into the design to provide this strength. For those on a restricted budget it is the ideal range to start with. The Master range, works with larger size and stronger material up to typically 25mm x 5mm, which allows larger scale projects to be tackled more easily and without the need for so much intricate scroll work or jointed metalwork. 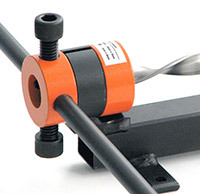 The Master tools require a larger work area and have greater versatility overall, but they can still be used to work the lighter gauge materials associated with the Practical tools. For serious DIY’ers and also commercial applications, the Master range is a sensible entry level range. The new XL range is larger still and is for the serious professional and industrial user that requires the power to work with larger and varied sections of steel. For the money it packs an amazing amount of functionality for commercial wrought iron producers, fabricators, and engineering & training workshops. For a comparison of these tools and their capabilities click on the METALCRAFT TOOLS button on the navigation bar above. How long will a punch pin last? Always keep punch pins well lubricated using oil this will ensure you get the maximum life out of a punch pin. Incorrect use through forgetting to follow the instructions supplied with all tools performing the punching operation. The most common mistake we encounter is users not supporting the metal bar that is being punched during the punching operation or not fully retracting the pin after punching as they try to remove the metal bar from the slot in the punch block. In both cases, large movements of the punched metal bar whilst the punch pin is still protruding through the bar and into exit hole of the block, will exert a large lateral shear force on the pin which it is not designed to withstand. By fitting a replacement pin and observing these guidelines you should minimize your pin breakages. 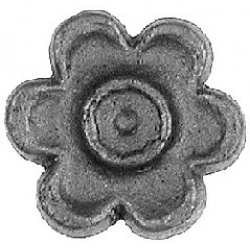 The life of a punch pin can sometimes be affected by the quality of the steel being punched. Some black mild steel bar can vary in hardness along the length of the bar and occasionally, you can hit a particularly hard spot which may lead to a pin breaking. If you replace the broken pin and try punching more holes and encounter breakages, we would be interested to hear of your problem and if possible to receive a sample of the material that was being punched at the time of the breakage to see if we replicate the problem at our factory. Will Metalcraft tools only work with special steel or metal and where can I get it? A. No. Metalcraft tools are designed and guaranteed to work with generally available Hot rolled (Black) Mild Steel or Annealed (softened) Bright Mild Steel to the specified sizes stated in the accompanying web pages. 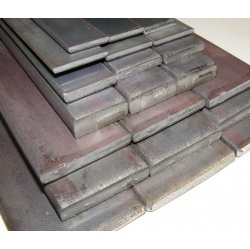 Such steels can be obtained from steel stock holders but if you have any problems or concerns then you can be re-assured that we can supply to your door handy packs of pre-cut steel in various sizes. These are ideally suited for use with Metalcraft tools and tend to be in much more manageable & affordable quantities than purchasing from a steel stockholder. Please note: If you should wish to use other metals, please contact our Technical Sales staff to discuss the suitability of using them with our tools. We would be most pleased to give our best advice and have successfully supplied either our standard or specially modified versions of our tools for all sorts of unusual applications including use with copper, brass, sterling silver, aluminium and in certain cases stainless steel. If you have a specific application in mind but are not sure whether our tools can produce it, you are always welcome to visit our premises by appointment and bring with you the material you are looking to work with or details of the idea you are looking to make. We can then attempt to make the item(s) to your satisfaction. Alternatively, feel free to send a sample of the material and an accurate drawing of the item you are wanting to make. How can I roll the right sized circle with Metalcraft Tools? Q. Do I need welding or metalworking skills to be able to use the tools? Q. How do I attach candle trays and other accessories to my finished metalwork? Q. Some of your designs show candle trays and clocks, where do I buy these from? Q. What can I make with Metalcraft? Q. 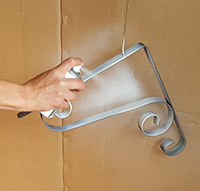 What coating or paint do you use on items made with Metalcraft tools? Q. What Guarantee is provided on the tools? Q. What size rivet should I buy for joining metalwork together? Q. What tools are available in the Metalcraft range? Q. What tools do I need to get started? Q. What training and support is provided for beginners? Q. Which range of tools would be best for me? Q. How long will a punch pin last? Q. Will Metalcraft tools only work with special steel or metal and where can I get it? Q. How can I roll the right sized circle with Metalcraft Tools?